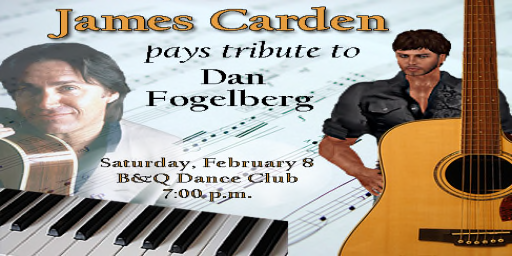 SL Singer/Songwriter/Musician James Carden will be Paying Tribute to the late Dan Fogelberg on February 8th at 7pm SLT - The B&Q Dance Club Event Stage. Join James as he will perform on Guitar and Keyboards featuring Familiar Hits and select album cuts spanning the career of one of America's top Singer/Songwriters. "Dan Fogelberg may be the biggest reason I became interested in music. Most people didn't realize that he wrote nearly all of his songs and played most of the instruments on his recordings" said Carden. The B&Q Dance Club has been a favorite of SL music listeners for years and their new event stage will host this Dan Fogelberg tribute along with future tribute shows.